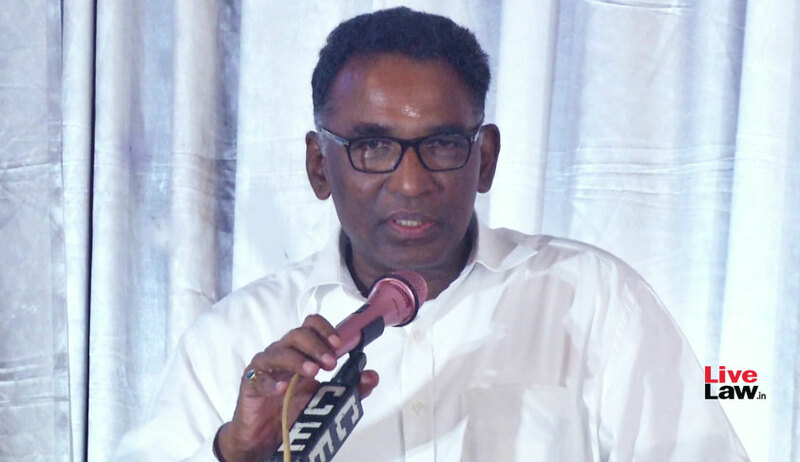 Former Supreme Court judge Justice Jasti Chelameswar opened up on the explosive events during the last phase of his term such as the order in Medical College bribery case, boycott of collegium meetings and the historic press conference. He was speaking at a seminar on the topic "Judicial Accountability and Independence", organized by All India Lawyers Union at the Bar Council of Kerala auditorium, Ernakulam, today evening. He minced no words in criticising the manner in which the order passed by a bench headed by him in the infamous "medical college bribery case" was overturned next day by a hurriedly constituted Constitution Bench. "Did at any point of time in the history of Supreme Court has a constitution bench assembled at 3.30 PM on a Friday on short notice? ", he asked, referring to the unprecedented proceedings on November 10, 2017,whereby the order passed by the bench presided by him was reversed on the principle that only the CJI had the power to constitute benches as per the "master of roster" principle. Chelameswar said that the judges of that Constitution Bench were "cherry-picked". Initially, a bench of seven judges was supposed to hear the matter. Later, the strength was reduced to five, for incomprehensible reason, he said. He also wondered what was the irregularity committed by him in referring the case to five judges' bench. He pointed out that as per the administrative order issued by the then CJI Dipak Misra, mentioning for listing could have been made before the second senior judge, when the CJI was unavailable. The CJI was heading a constitution bench that day and hence not available for mentioning. Therefore, there was no irregularity in entertaining the mentioning made before him, Justice Chelameswar said. He also pointed out that he did not "cherry pick" anyone to be in the five judges bench to which the matter was referred; rather, the bench was supposed to include five judges in the order of their seniority. He touched upon the historic press conference held on January 12 as well. "I have attained notoriety after the press conference. An 'eminent lawyer' recorded in his book that I had agenda behind the conference. If I have agenda, what about the other three judges who took part in the conference? ", the former judge asked. He further stated that the "eminent lawyer" had criticised his order in the medical college bribery case. But, this "eminent lawyer" has proudly narrated in his autobiography about his successful attempt during emergency days to thwart an attempt made by the then CJI to constitute a bench of hand-picked judges to review Keshavananda Bharathi decision. Justice Chelameswar wondered why similar high moral stance was not exhibited by the "eminent lawyer" during the happenings of Medical College case. "I have first hand experience to say that the manner of judicial appointments is a mystery", he confessed. He said that lack of transparency in the collegium meetings prompted him to stop attending it. The files and materials pertaining to prospective appointees are not freely shared amongst the members of the collegium. The CJI applies absolute discretion in the matter of sharing materials. He mentioned that a former CJI, with whom he shared the bench in the NJAC case, confided in him that "I am not happy with the system". "In this country, there is procedure even for the promotion of an LDC to UDC. If the procedure is violated, it will lead to litigations and interference by Courts and Tribunals. But, when it comes to appointments and transfers in judiciary, things are grey. It leaves a lot to be desired"
He urged that lawyers should not remain silent spectators when things go awry in the system. Lawyers should not form lazy opinions on the basis of popular impressions. He mentioned that when he delivered the dissent in NJAC verdict, he was branded "pro-establishment". Later, when he took an open stance in the case of elevation of Justice K M Joseph, a different narrative was tailored. "If this is the habit of judging people in public life, then do not expect much change", he said, exhorting that lawyers' stances on issues should not be based on fickle public opinion. "Independence and accountability go hand in hand. Independence without accountability will lead to despotism", he said. It was added that accountability was not confined to judicial actions alone, but to administrative actions as well. "Every aspect of judiciary needs to be accountable", he said. "I have received support of the young bar throughout. But not from the big shot lawyers", he said. He added that debates on these issues should not be confined to closed auditoriums but should translate to action. "It is the silence of well meaning people which encourages wrongs", he stated before concluding.